I should note that there is a swirl option (mixing two flavors), but one can only swirl adjacent flavors. In other words, they have four flavors running on two machines, and a customer can swirl the two flavors in one machine or the two flavors in the other machine. 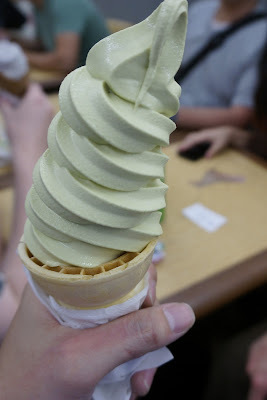 Unfortunately for me, the Matcha was paired with the Black Sesame and the Hoji-cha was paired with the Madagascar Vanilla. On a separate note, I got a small-sized ice cream, but I felt like I received a generous amount. In particular, Josh had ordered a large-sized ice cream, and later thought he should have just ordered the small. *Apparently there's a Matcha Love in the Costa Mesa Mitsuwa as well.